To Cite: Kheirkhah D, Mirsane A, Mirbagher Ajorpaz N, Rezaei M. Effects of Pilates Exercise on Quality of Life of Patients on Hemodialysis, Crit Care Nurs J. 2016 ; 9(3):e6981. doi: 10.17795/ccn-6981. Background: It seems that using Pilates exercises can increase quality of life of patients on hemodialysis. Objectives: This study aimed to determine the effect of Pilates exercises on the quality of life of patients on hemodialysis. 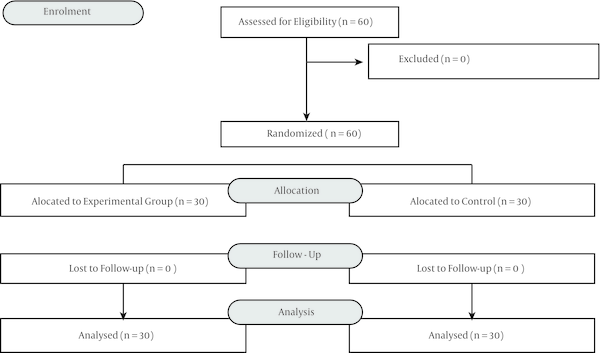 Methods: For this randomized controlled clinical trial, we enrolled 60 hemodialysis patients referred to Shahid Beheshti and Akhavan hospitals in Kashan city during 2014 and 2015. The subjects were randomly allocated to an experimental group (n = 30) and a control group (n = 30). Demographic information and quality of life short form (KDQOL SF) questionnaires were completed by the two groups at the beginning of the study. Then, modified Pilates exercises were carried out by the experimental group three times a week over a period of eight weeks. The KDQOL SF questionnaire was completed by all participants, at the beginning and two months after completion of the intervention. Data analysis was conducted using χ2 test, independent t-test, and paired t-test on SPSS software version 16. Results: Mean scores of QOL dimensions before and after the intervention are presented in Table 2. There was a significant difference in QOL Dimensions of the experimental group before and after the intervention (P ≤ 0.05). Mean differences of QOL dimensions at the Beginning and two months after the Study in the two Groups showed that there are significant differences in QOL Dimensions in the two groups (P ≤ 0.05). Conclusions: The findings affirmed the positive effects of the Pilates exercise on the quality of life of patients on hemodialysis. Chronic renal failure (CRF) is one of the main health problems around the world. In USA incidence and prevalence counts are expected to increase by 44% and 85%, respectively, from 2000 to 2015 (1). Average incidence of end stage renal disease (ESRD) in Middle Eastern countries with similar renal care systems is 93 per million (2). Similarly, the incidence and prevalence of patients on hemodialysis in Iran during year 2000 was 49.4 and 130.5 per million, respectively (3). Patients undergo health challenges that lead to a change in their quality of life including adjustment of their diets, using medications, and experiencing frequent hemodialysis (4). Their low quality of life (QOL) is a result of physical and mental problems of these patients (5). Therapeutic developments have led to basic changes in the lifestyle of patients on hemodialysis (6), but their low QOL is still a major problem (7). Nowadays, promotion of QOL is generally one of the major goals in the treatment of chronic diseases and has multidimensional and complicated aspects that include subjective and objective elements with dimensions of physical, emotional, social and mental welfare. Appropriate QOL is not only an important clinical issue but one of the major goals of treatment as well (8). Cupist et al. (2011) (9) reported that regular physical exercise plays a pivotal role in patients’ rehabilitation and improves aspects of their physical health, such as cardiovascular, metabolic and nutritional conditions. Pilates exercises, introduced by Joseph Pilates, are sets of activities that positively affect strength, posture, and flexibility of the body. Unlike most other exercises that only focus on the individual’s physical aspects, Pilates exercises consider not only the individuals’ physical dimension but also their mental aspects and they are based on balance between body and mind, which results in the improvement of individual’s mental and physical health (10). Pilates exercises are based on six principles including centering, concentration, precision, control, flow and breathing (11), and combinations of different static postures including supine, sitting and quadruped, without movements such as jumping and leaping (12, 13). Previous studies have shown that other types of exercise or physical activities also have effects on mental and physical health (14-17). That said, regarding studies on the use of Pilates, only three included climacteric women in their samples (17, 18) and in one study an analysis of the specific effects of a Pilates intervention was not performed, as it comprised of an analysis on the possible effects on QOL in practitioners of Pilates, aerobics and strength training (17). The study by kalron showed that no significant differences were observed in QOL of women who did Pilates exercise and walking (19). Although there are a few studies on the relationship between the Pilates method and quality of life (12, 20-22), other studies have focused on other aspects that could contribute to improving QOL in climacteric women (23). On the contrary, Segal et al. (2004) (24) found that Pilates exercise performed for an hour a week over six months had no effect on quality of life and general health of healthy adult participants. Likewise, Kuo et al. (2009) (25) showed that two 20-minute Pilates sessions per week for 10 weeks had no effect on older adults’ physical health. Parsons et al. (2006) and Thompson et al. (2016) (26, 27) conducted clinical trials using aerobic and resistance exercises involving patients on hemodialysis. They found that 30-minute intradialytic trainings three times a week over eight weeks and 10 times for two weeks (28) had no effect on respiratory muscle strength of chronic renal patients. With regards to the recent advances concerning treatment of chronic renal diseases, prognosis and QOL of patients is not yet satisfactory (29). Nurses can promote QOL of patients through patient education and planning special programs such as exercise programs (30). There is no unique regular, safe and constant sports program for these patients. High acceptance of Pilates in various studies shows that it can be considered as a regular and constant sport for these patients. The current study aimed to define the effect of Pilates exercise on the QOL of patients on hemodialysis that had referred to selected hospitals in Kashan. A clinical trial study was performed on 60 patients on hemodialysis that referred to Shahid Beheshti and Akhavan hospitals in Kashan city during 2014 and 2015. Sixty patients were conveniently sampled and randomly allocated to the experimental and control groups (Figure 1). The study sample size was calculated using the results of a local study conducted by Kanani et al. Based on the results of Kanani et al. (31), d and σ were respectively equal to 7.8 and 7. Accordingly, with a type I error probability of 0.05 and a power of 0.80, the sample size was determined to include fifteen patients for each group. Inclusion criteria were age of 18 to 70 years, a history of hemodialysis treatment two to three times per week for at least six months, interest in participation, being able to move independently and with a physical condition certified by a physician to play the sport, with no myocardial infarction or surgery in the past six months of the study. Exclusion criteria included three or more absences in exercise sessions; being a habitual Pilates practitioner; detection of reduced exercise tolerance, including tachycardia, shortness of breath, and feeling too tired or weak; peritoneal dialysis during the study; and other concurrent clinical conditions, such as cardio-respiratory problems reported by physician and/or patients. The data collection instrument consisted of two parts. The first part included the demographic and clinical information (gender, age, marital status, job, level of education, and dialysis duration) and the second part included quality of life short form (KDQOL SF) questionnaire. This questionnaire was modified for the Iranian culture. The subjects were asked questions concerning the satisfaction of patients and about the level of importance they considered for each question (4). This tool measured four dimensions of QOL, health and functioning (21 questions), socioeconomic (10 questions), psychospiritual (23 questions) and familial (eight questions) in two domains of satisfaction and importance. The total obtained scores from QOL were classified into five groups of 81/100 as “completely appropriate”, 61/80 as “relatively appropriate”, 41/60 as “average”, 21/40 as “relatively inappropriate”, and 0/20 as “completely in appropriate”. Content validity and internal consistency methods were adopted to check validity and reliability of the data collection tool with Cronbach’s alpha of 95% and 91% in the two domains of satisfaction and importance, respectively (4). In this study, a modified Pilates exercise protocol for chronically ill patients suggested by Ashrafinia et al. (2014) (32) was used. The sessions were administered by a qualified professional in Pilates exercises in the hospital’s gym. During each session, the professional coached a group of three to five participants to ensure an adequate execution of movements. The exercise included 13 movements: bridging, hundred, roll up, one leg circle (both ways), rocker with close legs, single straight leg stretch, double leg stretch, spine stretch forward, single leg kick, side kick up and down, side kick circles, rest position (stretch and relaxation), and curling. Before and after exercise, warm up and cool down movements were performed. In this protocol, flexion-extension movements with a focus on deep breathing and whole body stretches were performed. The risk of the exercise for the participants was assessed by an expert in sport physiology and was noted to be a minor risk. According to the nephrologist and exercise professional, the exercise was carried out during days, during which hemodialysis was not administered. According to the Iranian association of renal patients, the exercises were carried out in the mornings. During the course of the program, the repetition and intensity of exercises were gradually increased. In the first week, all 13 movements were repeated four times per session and continued until the end of the program. After the completion of the study, the participants in the experimental group were provided additional information about the benefits and costs of the Pilates exercise by the sport professional using educational videos and pamphlets. Furthermore, for the control group, an educational session on hemodialysis care was provided. The participants in the control group were asked about physical activities beyond their routine daily activities for the purpose of exclusion. The participants in the two groups were followed up by weekly phone calls for further consultations. The KDQOL SF questionnaire was completed by all participants, at the beginning and two months after completion of the intervention. The results were finally analyzed by the SPSS software version 16 software using chi-square and t-tests with a significance level of 0.05. Eighty percent of the patients in the experimental group and 90% of the controls were married. In the experimental group, 83.4% patients were male, as compared with 86.6% male controls (Table 1). aBased on the Chi-Square test. bBased on the Mann-Whitney U test. Mean scores of QOL Dimensions before and after intervention are presented in Table 2. There were significant differences in QOL Dimensions in the experimental group before and after the intervention (P ≤ 0.05) (Table 2). aBased on the Paired t-test. Mean differences of QOL dimensions at the beginning and two months after the study in the two groups showed that there was a significant difference in QOL Dimensions in the two groups (P ≤ 0.05) (Table 3). aThe mean differences defined by the mean scores of QOL dimensions at the beginning and two months after the study, minus the mean scores of QOL dimensions at the beginning of the study. bBased on the independent t test. This study investigated the effect of Pilates exercises on the dimensions of the QOL status including health and functioning, socioeconomic, psychospiritual and family. At the end of the study, differences between the scores of the control and experimental groups were significant. These differences in the experimental group, before and after the intervention, were also significant. However, in the control group no difference was observed between the scores of the QOL at beginning and the end of the study. Although our results on QOL confirm the findings of other authors, it is also true that the intervention was not similar in all of its aspects. Therefore, while some studies also used two sessions a week (22, 33, 34), other studies used one session a week (24) or three sessions a week (20, 29, 30). There are a few inconsistencies with other studies related to the total intervention time. Some studies also lasted 12 weeks (34), although other studies had a six-month (24, 33) or one-year (35) duration. However, in some studies, the total intervention time was shorter than ours: four weeks (36), five weeks (37), six weeks (38), or eight weeks (39). This fact confirms the statement by de Souza and Vieira (40) that there are no established protocols on Pilates exercises that are commonly used. This lack of established protocols should be taken into account in future studies because studies like that by Cruz-Ferreira et al. (33) have shown a significant improvement observed with a Pilates intervention regarding QOL after a six-month intervention, but not after a three-month intervention. This aspect does not correlate with our results or with the results of other studies (22, 34, 37). Based on the results in the table, mean QOL in the dimension of health and function showed a significant difference after intervention in the two groups, which reveals that Pilates exercise could promote QOL of patients in this dimension. The study of Rodrigues et al. (2010) (41) showed that the use of the Pilates method as exercise in older women improved quality of life. Female breast cancer patients, who undertook combined home exercises and supervised Pilates exercises, had improved quality of life at the end of the study period (18). However, patients with ankylosing spondylitis, who underwent the same intervention, did not get better (42). In the study by Kucuk et al. (2016) (23), socioeconomic, psychospiritual and health and functioning in patients with multiple sclerosis showed a significant difference after the intervention compared to before the intervention. Similar effects have been found in patients with chronic unspecific lower back pain (43), cancer (18) and fibromyalgia (42). Borges et al. (2014) (44) indicated that all the dimension of QOL had a significant difference in patients with lower back pain but had no significant difference in the physical functioning dimension. In the study by Angın et al. (2015) (20) physical functioning, general health and QOL of the patients with multiple sclerosis showed a significant difference after the intervention compared to before the intervention. Netto and Brites (45) showed that Pilates exercise had no significant difference in the pain dimension of the quality of life. The limitations of this study include the lack of an objective measure of posture and muscle strength, which may explain some of the findings. In the statistical analysis of the results, the group treatment sequence could be a source of bias. Small sample size and male to female ratio are other limitations of this study. Therefore, further research with larger sample size in these patients is recommended. Conducting a study to compare the effects of Pilates exercise and another group intervention can help ensure the accuracy of the interpretation of findings regarding the effectiveness of exercise. According to the findings, Pilates exercise can be considered as an effective alternative for improving hemodialysis patients’ quality of life, health, and socioeconomic, psychospiritual and familial functioning. Due to the cost-effectiveness and safety of this method, we propose the inclusion of this program in the treatment protocol for patients on hemodialysis. We are grateful to the research deputy of Kashan University of Medical Sciences for their financial support. We would like to thank all patients, who participated in the study. Authors’ Contribution: Neda Mirbagher Ajorpaz: developed the original idea, study concept and design, and study supervision; Davood Kheirkhah, Sayed Alireza Mirsane and Mahboubeh Rezaei: study concept and design, acquisition of data, analysis and interpretation of data and writing of the manuscript. Funding/Support: Our research project was fully funded by Grant No.9464 from Kashan University of Medical Sciences, Kashan, IR Iran.